Amazon PPC: Why are my Costs High and Sales Low? This is the first of a new series called Readers’ Questions, in partnership with Emanaged and Online Seller Consulting. I’ve been selling private label skin creams and treatments on Amazon for a few months. I am new to Amazon. I was a professional accountant in the past so the math doesn’t trouble me. I’ve been trying PPC ads but need help. My ROI is low and many of my campaigns are not performing. Advertising cost of sales [ACoS] seems high, but I don’t really know what to expect. I also don’t know why some are inactive for my own product? — Mike B., from Ohio. Hi Mike! I have good news and bad news. The good news is you’re not alone. Misery always loves company, so they say. I personally prefer to sob alone, watching TV adverts about puppies… But returning to topic, PPC is a battleground not just for newcomers but also Amazon veterans. It’s not something you get perfect and then just leave alone. Amazon PPC, just like traditional web PPC such as Google AdWords, requires constant adjustments. The bad news is that there isn’t a magic ingredient or secret weapon to be successful. If anyone had one, they would be using it, from their laptop, while sipping martini’s poolside. They wouldn’t be sharing it either! Before we get into your specific question, it will be useful to cover some of the basics. Most of these concepts apply to all industries, but use your best judgment to account for seasonality, category nuances or your personal business model. Being an accountant, Mike, I’m sure you just rolled your eyes. Sorry. 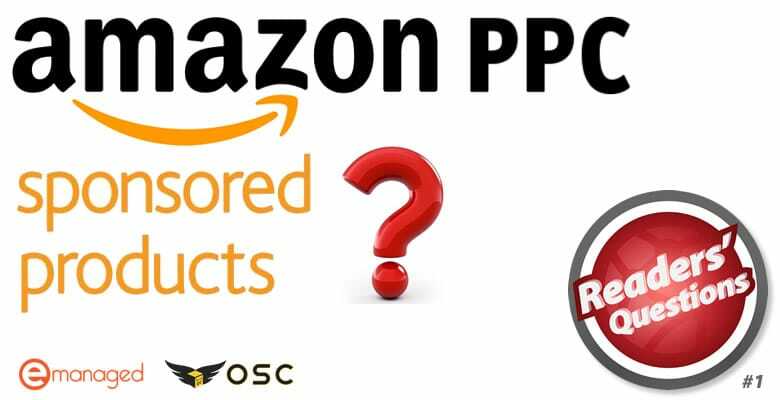 Amazon PPC campaigns are about finding good search terms a buyer will input on Amazon with the desire to buy your product. Then it’s a case of competing with other sellers who are also willing to spend on capturing a prime position on the buyer’s search results page. Check your profit margins. One sale with a 45% margin is worth more than 10 sales with a 3% margin. Because you’re bidding against others, your ROI and ACoS are going to fluctuate. It’s normal to have changes over time, and different campaigns performing differently. Low ROI could mean a few things. Are you overbidding in proportion to your margins? Are you getting a lot of clicks, but no sales (high ACoS)? Given your background, I suspect numbers aren’t an issue but it’s worth mentioning that you should double check your profit margins if you are spending too much. Sellers can sometimes focus on sales and not realize they are not making any money! One sale with a 45% margin is worth more than 10 sales with a 3% margin. Make sure you’re factoring in everything before you determine your maximum bid amounts. A high ACoS or low conversion rate might also be due to a lack of relevance (this is more likely to be the issue). If you are bidding on “cream for men”, that could be anti-itch cream, anti-wrinkle cream, dry skin cream… and other creams. Also, if a buyer is searching for “cream for men”, it’s questionable whether they have any clue what they truly want at that point in their journey! First, let’s have a plan we can deviate from. Similar to life in general, and before we go into details, it’s important to ask why you’re here. What is your purpose with these PPC ads? What do you want to achieve before your budget ends? Your answers will dictate if your ROI and ACoS should be low or high. If you are promoting brand new ASINs with no history, you should think of all this as a marketing expense for new lines. Your ROI might be low for a while, as it’s is all about getting the product name out there. If I’m selling the world’s best Unicorn Spam, I need to think short-term about loss-leading activities that get that wholesome spam into people’s bellies, so they tell friends and family and come back for more. A portion of my Unicorn Spam will be “written off” in order to help sell more of it with less advertising in the long-term. I’m probably not telling you anything new by saying that a new ASIN, on a new Amazon account, is going to rank low in organic search results. 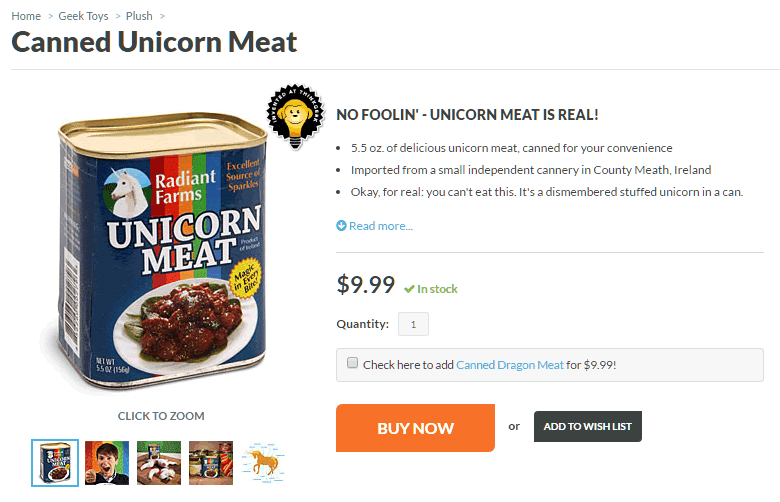 It might be made from the most beautiful and lean Unicorns out there, but it still won’t sell if nobody can find it. A negative ROI or very high ACoS might all be part of the plan to get some history behind the ASIN. After a point, you can turn down the spend and bids, allowing you to ride the history you’ve built into more organic sales. But all Unicorn Spam has a shelf life. It costs you to have it sitting around, gathering dust. Similarly to above, perhaps the high ACoS / low ROI is part of a master plan to simply get rid of your stock? PPC campaigns can help you test theories without changing your core listing data. You might have a theory that a small niche of the market is looking for “cream that makes me look like Brad Pitt”. You don’t really want to put that into your title at this point, because you don’t know if anyone still remembers him. But you can wrap a whole campaign around the theory, and find out secretly! Who knows, maybe it’s George Clooney who has the niche here. You can conduct what is known as an A/B test. Strictly speaking it’s not a true A/B test, but it sounds fancy all the same. Basically, you are testing theory A against theory B. On your own ecommerce store, this usually means having the exact same item on two listings, and making a change on one while leaving the other. Then you sit back a few weeks and see what happens. Amazon doesn’t allow you to do A/B testing at a listing level, but you can have as many simultaneous ad campaigns as you want. Or you can try one campaign for two weeks, then a different one for the next two weeks, and compare the results at the end of the month. Search terms. Will “cream to make me look like George” perform better than “George Clooney’s face cream”, or will “Brad Pitt’s anti wrinkle cream of choice” reign supreme? Images. You could test Brad’s left side against his right side, or Brad against George etc. The image people see on the ad is perhaps the most important thing to consider after search terms. Titles. The first part of the title is the most important (more on this later), but be sure to try out new ideas across the board. Also don’t neglect bullets, descriptions and other data. They count too, especially to convert someone who has just landed on the listing. There are some weird myths about PPC. Some suggest that there are arcane rules you must never break, lest you wish to anger the Amazon Gods or immediately get struck by Thor’s indigestion. But no one rule is always true for all situations. Numero uno isn’t king. It really isn’t. You can have a very successful campaign from search terms far down the list. Why? Because you’ve just tapped a niche. If everyone is bidding on the same core search terms, the price to compete is likely to be high. It also means a lot of people are fighting for position, making it harder to gain a significant portion of the market. If you can find a group of search terms that few people are bidding on, it might be an opportunity. Sure, fewer people will be inputting them, but fewer people will be bidding on them too. The market you are tapping into is smaller, but it has less competition and you are spending less. Yeah… no you don’t. I might start an argument here, but that’s the fun part. Why? What magical reason for “ten” is there? Why not nine or 13? The argument is that the ASIN has no reviews, so buyers won’t trust it and you will be spending money for nothing. Let’s turn this logic upside down. How are you going to get reviews in the first place? Maybe PPC is part of the plan? And how many buyers check the reviews? I know a lot do, but I don’t. I don’t care, because Amazon policies have me protected. If the item arrives damaged, faulty, breaks in the first 5 minutes, wasn’t as advertised, etc., Amazon is going to look after me. Do I look scared? …so Amazon awards you secretly in the algorithm. This one actually might be true, but I would only consider it later down the road. Just kidding! Tips: what CAN you do? The main piece of advice to keep repeating in your mind is this: be inventive. Try out new creations. If you have a silly thought in the shower, go try it. It might fall flat, but who will know? Most creative ideas are going to miss the target. But they will confirm what didn’t work, and some will work. Let it run for a few weeks. Your ROI will be high and the campaign won’t produce particularly great numbers, because you did just ask Amazon to help you spend money advertising on its own website. What an automated campaign does provide is this: insights. After a few weeks of letting it run, download the report. It will give you a ton of search terms your buyer audience inputted recently. That report can now kickstart your manual campaign, which can be more focused and given more control and thought. It won’t be perfect, but it will speed up getting a good manual campaign fleshed out. Who knows, it might even tell you upfront whether the face of Brad Pitt or George Clooney wins for your creams. Don’t bid on “face cream”. Those words are meaningless. If someone is looking for “face cream”, they have no idea what they want yet. Bidding on broad terms like that will have you going after people who are still in window-shopping mode. It’s going to waste your time and theirs, not to mention your money and conversion metrics, to go after this search term. Consider narrower terms like “anti-ageing cream” and smaller niches like “anti-wrinkle cream”. Without knowing the details, it’s impossible to say what is right or wrong for you. But think about being relevant to the right potential customer from the search term they used to find your listings. Adjust your bids to match. If your daily budget is low, you might run out in the first few clicks. That’s rarely enough time to find out how well the campaign is working, so make sure you have enough of a budget to generate a bigger batch of data. Don’t budget so much that you need to sell your home if something goes wrong, but do give it enough to produce results. If it works or fails, it’s still valuable data you can save and use to refine the next campaign. The title is going to cut off at around the 35 character mark. Buyers will only see the first 30-35 characters. So make sure your title is relevant enough to the search term and image in the first 35 characters. If your title is “The best Anti Ageing long lasting Facial cream on the planet EVER”, the buyer might see “The best Anti Ageing long lasting F”. I think that makes the point. You can also define the words you don’t want to associate to the campaign. It’s not as important as being relevant, and a good use of broad match and exact match terms often means it isn’t critical. But you might want to make sure that buyers searching for completely irrelevant phrases never see your ad, like “Facial cream to look like Jeff Goldblum”. No one needs that in their life. If you only have three products, you can skip this point. But if you have thousands of items, this is for you. Basically, use the bulk action tools. Download your campaigns, make adjustments on the Excel file, then upload them back. This can be useful to check margins when changing bids, make comparisons with other files, and do some VLOOKUPs. Mike, if you were an accountant and don’t know VLOOKUPs, let’s just say I understand why you’re now selling online. But for those who are not Excel-savvy, just Google it. It’s dead easy. If you make a change, and sales are down the first hour after you made it… well, it might be due your change. Or it might just be chance. Sellers can sometimes examine a day’s results and conclude that something terrible has happened. One day’s results are typically meaningless. A week or a month are better. Don’t get me wrong, if you increased the price by 600%, it is likely to be the reason you haven’t sold anything since. Adjust course if things are massively off from where they should be. But generally give your changes time to produce results that have a clear character. Why aren’t my campaigns running? Sometimes you might have a campaign which isn’t performing, and upon further examination, you realize some listings are inactive. You might see a “this listing is not eligible” message for example, but with no details as to why. Your seller account is healthy. You can’t advertise if you are being naughty. If you have loads of cancelled orders, a daily A-to-z tally the size of Cambodia’s alphabet (it has 74 letters), are being rude to buyers, or are sending them buckets of mayonnaise instead of face cream, you won’t be allowed to advertise until you get a bit more organized. Did you pay to play? As we touched on earlier, be sure you’ve got a budget to maneuver within. Amazon isn’t going to let you advertise for free, no matter how many animal sacrifices you make. This has become a long reply, sorry. But this topic is like one of those powerful onions. Sure, it’s a great addition to your sales recipe, and helps make your balance sheet healthier, but it has layers of complexity which can make you cry at first. The key is to be creative, inventive and logical. If something works, enhance and grow the idea. If something doesn’t, pivot and try something new. But please Mike, do let us all know if Brad or George got more hits. Cool post. Im not so advanced AMZ seller to get most of the points now…just a newbie but your response is as useful as hillarious. Hopefully more useful than hilarious!